As much as I love this quote, I have a very hard time ignoring monkeys. The monkeys are all up in my business, making a racket, disturbing my peace. They are mucking up the works, getting in the way, slowing down my efficiency. Moreover, the stubborn little beasts won’t listen to a word I say! That’s because they’re not my monkeys. Dang, I have wasted so much of my time in the wrong circus, frustrated with other people’s monkeys! 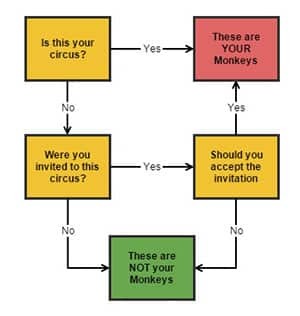 I’d like to offer you the following flowchart to help you determine if any given monkeys are YOUR monkeys. If you brought the circus to town, well then those are your monkeys to deal with. But take a look around at this circus… Is it yours? How did you get there? Were you invited? If you were not invited then no one is going to listen to a word you say about how to corral the animals, so don’t waste your breath. If you were invited, you don’t have to accept the invitation. There are so many monkeys and so little time; choose your monkeys well. Just contemplate for a moment, how much more you can get done in your world if you only focus on your own monkeys, in your own circus! Now we’re talking about a manageable bunch of monkeys! Why, you might even find a few moments of peace! Going off to “teach” my monkeys right now.